Presented in conjunction with Curating Lab 2012, the Curatorial Roundtable series is a public talk series that gathers together curatorial and industry practitioners across different spectrums to discuss their latest exhibitions and projects. 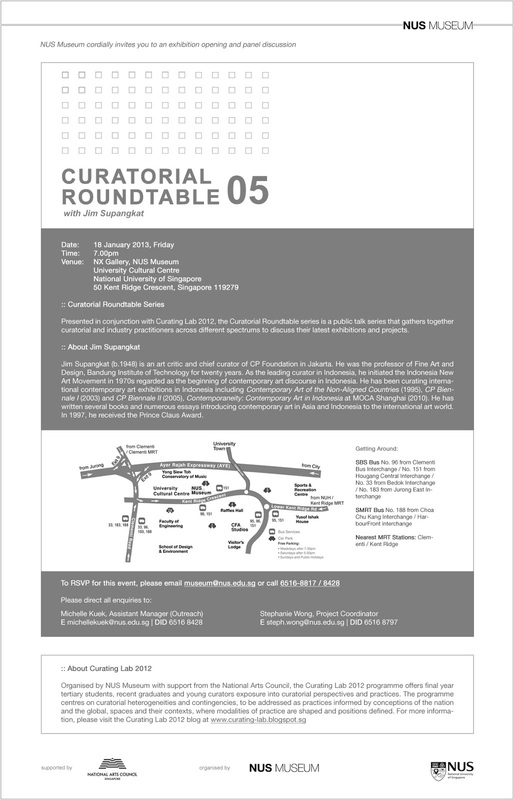 Although presented primarily for the participants of Curating Lab 2012, the series is an opportunity to bridge the gap between the curator and the audience, providing opportunities for interaction and stimulating discussions on curatorial practices and process. Jim Supangkat (b.1948) is an art critic and chief curator of CP Foundation in Jakarta. He was the professor of Fine Art and Design, Bandung Institute of Technology for twenty years. As the leading curator in Indonesia, he initiated the Indonesia New Art Movement in 1970s regarded as the beginning of contemporary art discourse in Indonesia. He has been curating international contemporary art exhibitions in Indonesia including Contemporary Art of the Non-Aligned Countries (1995), CP Biennale I (2003) and CP Biennale II (2005), Contemporaneity: Contemporary Art in Indonesia at MOCA Shanghai (2010). He has written several books and numerous essays introducing contemporary art in Asia and Indonesia to the international art world. In 1997, he received the Prince Claus Award for this attempt.